Genre: Short Stories, Australian Fiction. 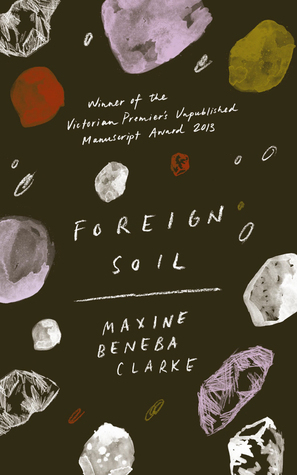 Winner of the Victorian Premier's Unpublished Manuscript Award 2013. In Melbourne's Western Suburbs, in a dilapidated block of flats overhanging the rattling Footscray train-lines, a young black mother is working on a collection of stories. The book is called FOREIGN SOIL. Inside its covers, a desperate asylum seeker is pacing the hallways of Sydney's notorious Villawood detention centre, a seven-year-old Sudanese boy has found solace in a patchwork bike, an enraged black militant is on the war-path through the rebel squats of 1960s' Brixton, a Mississippi housewife decides to make the ultimate sacrifice to save her son from small-town ignorance, a young woman leaves rural Jamaica in search of her destiny, and a Sydney schoolgirl loses her way. This is the first book in my read-through of the Stella Prize 2015 shortlist nominations. If you want to learn more about them, please click here. I have a habit of putting books like this on my Goodreads wishlist shelf but then never reading or even thinking about them ever again. It’s sad because it means that I probably miss out on a lot of good books, like this one turned out to be. That’s why I wanted to do this Stella Prize read-a-long in the first place, because it meant I had to actually pick up all these books that I wouldn’t have read otherwise. If the rest are anything like this one, then I’m in for a real treat. I should preface this review by saying that I’m not a big short story reader, nor am I very diverse in my reading. With that being said, you can probably guess that I really loved the diversity of this. Not only is the whole collection diverse from what I generally read, but each story was diverse from the next. There were so many ways in which the stories were different so I’m going to mention a few here. Firstly, there were so many different settings. There were places I was familiar with- like Melbourne and London, and then completely foreign (see what I did there?) places like Jamaica and Uganda. It was absolutely amazing to read about all these different places through the eyes of the characters, and I really felt like I’d be transported there. There was also quite a cast of characters – they varied in age, race, gender, religion, background, voices. There were ones I definitely didn’t like for whatever reason, but they were all incredibly interesting. Finally, the stories were set in different times and tackled so many different issues that were incredible to read about, but they all connected with the theme of displacement. It was intriguing to see the ways in which different people could feel displaced in their lives, and at sometimes it was oddly relatable. I think one of my favourite things, however, was the language. Each story has a different tone, a different voice to go with the characters – some are written like the majority of novels out there, others were more based in the culture and dialect of that particular character. The language and issues were tough, but strangely beautiful and haunting. This is definitely something I’d recommend and I can’t wait to see how it stacks up against the other Stella Prize nominations.